Midgley is an old Yorkshire name, being the name of two villages: one about 5 miles south-west of Wakefield, the other 1 mile east of Mytholmroyd. There is a Midgley website run by Tim Midgley, which provides a wealth of information on the origins of the family. My branch of the family came from the village of East Keswick, in the parish of Harewood, about 7 miles north of Leeds and 4 miles southwest of Wetherby. In the 19th century, Midgley was one of the commonest surnames in the village - see the extracts from the census. In contrast, the 1999 electoral register contained no Midgleys living in East Keswick. I have produced a tree showing the descendants of Joseph & Margaret Midgley in the village, available as a pdf file. 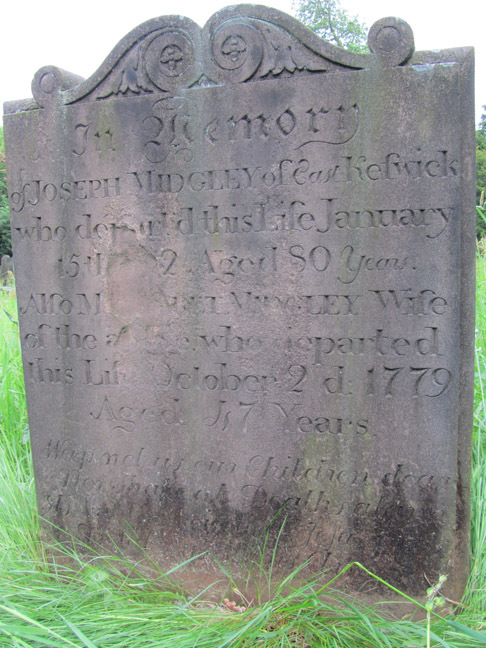 A Joseph Midgley of Adel was buried on 26th June, 1765. Joseph was christened at Adel parish church on 23rd May, 1731. Ann Midgley, born 14 April 1755. Married John Dolby. Joseph Midgley, born 23 November 1756. Married Jane Burniston. John Midgley, born 19 November 1758. Married Mary Marston. Robert Midgley, born 13 December 1760. Married Mary Midgley. William Midgley, born 21 January 1763. Married Elisabeth Holmes, then following her death in 1802, married Catherine Parker. James Midgley, born 12 March 1768. Married Mary Hague and moved to Sherburn-in-Elmet, and later Collingham. We whose names are hereunto subscribed being Protestant Dissenters, do intend to make use of the house of Thomas Wright in the town of Keswick, in the Parish of Harewood, in the West Riding of the county and diocese of York, for the public worship of Almighty God. As witness our hands this 30th April 1779. Joseph is listed in Harewood Court Records as being a juror in the year 1785. He is described as a 'bylawman', meaning a court official responsible for the enforcement of court orders. Joseph's wife Margaret died in 1779 at the age of 47, but Joseph lived well in to old age. From his will, it is clear that he remarried, with his second wife being called Mary. He died on the 15th January 1812, at the age of 80, and was buried in Harewood churchyard. Other beneficiaries in his will were his wife Mary, his sons Joseph, Robert, James and Jonathan, and his grandsons William and Richard Brommit (presumably sons of his daughter Elizabeth). A codicil written in 1811 updated the will to reflect the death of his wife Mary and son Robert. Robert Midgley, born 16 August 1809. Married Caroline Louisa Webster and moved to Bradford. Mary Midgley, born 21 January 1813. Married David Parker, farmer and sub-postmaster. John Midgley, born 5 March 1815. Farmer of 165 acres in East Keswick in 1851. Died 1866. James Midgley, born 6 August 1818. Living on his brother John's farm in 1851. Died 1855. Ann Midgley, born 17 March 1822. Remained unmarried. Post Office clerk (for David Parker, above) in 1891. Jonathan was, like his father (or was it his elder brother?) Joseph, a Methodist, and his name appears in the Registry Book at York Minster, applying to make use of the house of William Midgley (probably his brother) for worship. This entry is dated 20th April 1795. Their youngest five children were all born in East Keswick, and baptised at Harewood. Jonathan was a farmer, and the "East Keswick Millenium Book" records that in 1833, Thomas and Jonathon Midgley took the tenancy of Field House Farm, a substantial farm to the north of the village, which was to be associated with the Midgleys for the next hundred years. Esther died in 1843 at the age of 62. Jonathan died on 9th May 1849, aged 78, and is buried along with his wife in a grave in Harewood churchyard. The memorial inscription describes them both as "of Harewood Moor", and another source gives their abode as "Moor House, Harewood". In his will, Jonathan favoured his four youngest children, who were still living with him at the time of his death. His older children weren't totally forgotten: Thomas had predeceased his father, but his children got 5 shillings each, Elizabeth and Robert got £50 each. The 1841 census for East Keswick indicates that Thomas was born in Yorkshire, and his age at death indicates that he was probably born in 1805. His baptism is not recorded in the parish register for Harewood, which suggests that he was born in another parish, but then moved with his family to East Keswick while he was young. Alicia Midgley, born 3 July 1832. Married Ambrose Brogden and farmed at East Rigton. Thomas worked as a farmer. Thomas died of smallpox on 31st January 1843, aged 37, and was buried at Harewood parish church. His widow re-married, in 1850, Charles Buckborough, and continued to live in East Keswick until her death in 1891. Charles Henry Midgley was born on 15th January 1834, in East Keswick, near Wetherby. He was baptised on 30th March of the same year at Harewood parish church, and lived in East Keswick before his marriage. He married Sarah Ann Hogg on 8th August 1857, at Collingham parish church. Sarah Ann was the daughter of Thomas Hogg, a farmer, and his wife Mary, originally from Collingham but having moved by this time to the nearby village of East Keswick. Charles Hogg Midgley, born 1859. A schoolmaster in Nottinghamshire in 1881. Later lived in Scarborough. Osmond Midgley, born 1867. Farmed at Field House, East Keswick from c.1900 to c.1930. Married Charlotte Wrigglesworth. Annette Midgley, born 1869. Married Charles Howarth, a timber merchant, and lived in Collingham. Mary Ann Mar Midgley, born 1874. Married Frank Browne and lived in Wetherby. Charles's occupation is given as Farmer on his marriage certificate, Farm Labourer in the 1861 census, and "Farmer of 9 acres" in the 1871 census. 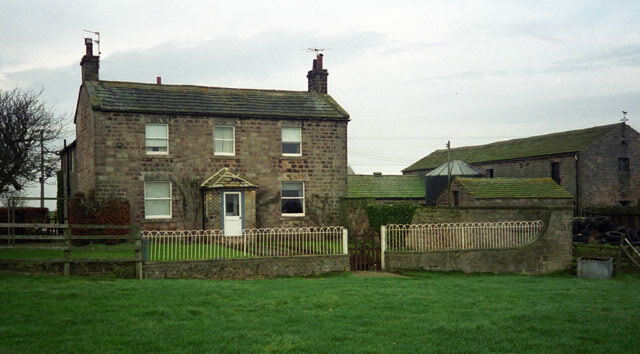 Charles and Sarah lived at East Keswick for most of the time following their marriage (they were living with Sarah's father in South Street in April 1861), but appear to have briefly lived and farmed at Beckwithshaw, near Harrogate, around the time of James's birth in July 1861. Charles died at the age of 42, on 26th or 27th November 1876 (sources vary). By the time of his death, he had moved to Field House, a substantial farm to the north of the village of East Keswick. He was buried at the church of St Mary Magdalene, East Keswick, where there is a large gravestone at the front of the church. His widow continued to farm at Field House until shortly before her death in 1908, by which time she was living at South View, East Keswick. James was born at Otley Road, Beckwithshaw, in the parish of Pannal, near Harrogate, on 25th July 1861. By 1863 the family had moved back to their home village of East Keswick, where James grew up. By the time he was 20, he was farming, with his mother, at Field House, a large farm to the north of the village. He married relatively late for those days, at the age of 32. His bride was Mary Emily Bentley, who came from a family of innkeepers in Holbeck, Leeds, although her paternal grandmother, Eleanor Hartley, had been born in East Keswick. The wedding was at St Matthew's parish church, Holbeck, on 13th April 1893. Mary moved to live with James in East Keswick. In December 1894, James was elected to East Keswick parish council. Various sources indicate that James was living and farming at Far Field House from 1894 until at least 1908. The 1901 census shows the family at Moor Farm, although I believe that is an alternative name for Far Field House. By 1911 the family were living at Langwith Terrace in Collingham, although James was still shown as being a farmer and an employer. A 1912 directory also lists James at Langwith. The family then left Yorkshire, moving 50 miles northwest to Kirkby Lonsdale in the county of Westmorland. The reason for this move was explained to me by my great aunt Louie, James's younger daughter. James's horse and cart was involved in a collision with a steam roller on the road to Wetherby, and he sustained injuries which prevented him from farming. He and his family initially moved to Langwith Terrace, Collingham. Mary had a nephew, Harry Wilkinson, who was a keen motorcyclist, and regularly went to rallies in Morecambe with a friend, Frank Speke. They used to call at the Temperance (Waverley) Hotel in Kirkby Lonsdale, where the hotel owners had two daughters, Isabel and May Airey. Harry and Frank married the two daughters in 1913, so the Midgleys got to know the hotel owners. When they decided to sell, James Midgley bought the hotel. Kelly's directory of 1914 lists James's address as Temperance hotel, Market square, Kirkby Lonsdale. He was still there in 1918 when his daughter Doris married: James's occupation is given as Hotel Keeper. A 1924 directory lists James at "Brian Garth" (sic), Norton Road, Sandylands, Heysham. He died on 22nd February 1932, at Norton Road. Mary died in 1948 at "Briar Garth", 17 Norton Road, Heysham. Doris was born at Far Field House, East Keswick on 5th January 1894, the first child of James and Mary Midgley. She was christened at East Keswick on 4th March, 1894. As a girl she lived at Far Field House (or Moor Farm), then later at Langwith Terrace, Collingham. In 1911, aged 17, her occupation is given as Typist. Around 1913 she moved with her family to the Temperance Hotel in Market Square, Kirkby Lonsdale, where her father had taken over as hotel keeper. Five years later, she married Joe Braithwaite Armitstead, who also lived in Market Square. The wedding took place on 15 August 1918, at St Mary's Parish Church, Kirkby Lonsdale. The family moved to 48 Brunswick Road, Heysham, some time after James's birth, and later (mid or late 1930s) moved to 153 Torrisholme Road, Lancaster. After Joe died in 1967, Doris continued to live in the same house, and remained active and independent well into her old age. She was able to walk the mile into Torrisholme village and catch a bus home until the age of about 90, and it was only in her last couple of years that she became a little unsteady on her feet, and began to rely on others for assistance with shopping and other tasks. She died peacefully in her sleep on 2nd December 1986, a month short of her 93rd birthday, and was cremated at Lancaster & Morecambe Crematorium.